The church is at the bottom of Chapel Hill, Stansted CM24 8AG (B1051). Follow the sign to Chogou. The car park is behind the church. On 1st September 2006, the Methodist and United Reformed Churches in Stansted (Essex) joined to form Stansted Free Church (Methodist/URC). The Methodists had been worshipping in the Quaker Meeting House for over 75 years, as they had no building of their own. They are delighted to now have their own ‘home’! The joint church meets in the former United Reformed Church in Chapel Hill, Stansted CM24 8AG. The church and hall have been refurbished to provide a welcoming and comfortable environment with a small fitted kitchen, full disabled facilities and free car parking. The hall is used regularly by village groups but is also available for hire for one-off events. Free internet access is available for all users of the church and the hall. Please email us for details. is our church newsletter. To read this month’s edition please click here. You will need to have Acrobat reader installed. To view previous editions of Imagine, please click here. 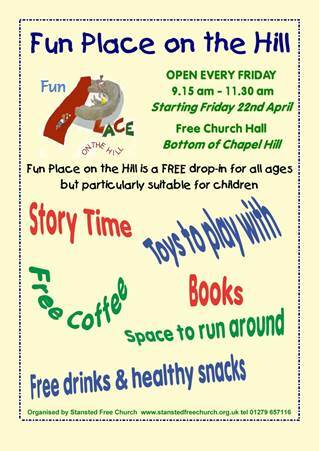 Messy Church is proving very popular and our next event is on Good Friday 19th April 3.30 – 5 pm at our church. Visit www.stanstedchurches.com/messychurch for pictures and more details. Over the summer we supported the Stansted Bouncy Picnic arranged by Stansted Messy Church and Stansted Family Café. See www.stanstedchurches.com for more details. If you have used inkjet cartridges, please consider recycling donating them to our church funds, using pre-paid envelopes. Please follow this link to see details. Alternatively, you can drop them into one of our boxes at the church on Monday, Wednesday or Friday mornings 9.30 am – 12.30 pm. All makes except Epson can be taken, but they must be originals, not own brand. We currently have a URC minister Rev’d Roy Fowler who began his ministry with us in October 2014. Our worship is varied with some formal services and some informal services catering for all ages. During the winter months, our services are sometimes held in our warm and comfortable hall. 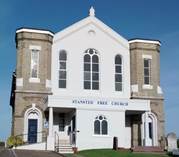 Stansted Free Church is part of the Bishop’s Stortford Methodist Circuit and the West Essex & Bishop’s Stortford URC Pastorate (WEBS), which also includes Bishop’s Stortford URC, Clavering LEP and Saffron Walden URC. Rev’d Caroline Vodden has pastoral responsibility for the Saffron Walden and Clavering churches, but like Roy, serves all the churches in the pastorate.